I did it! And with no major disasters, upsets, re-dos or tears. Thank goodness. 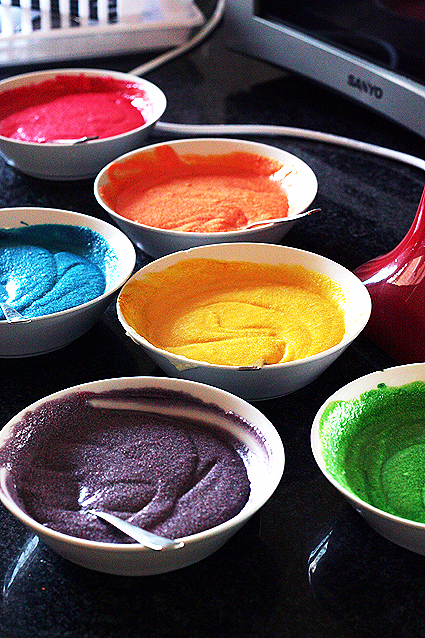 I’ve been looking for an excuse to attempt a rainbow cake for a while. My nanna’s 78th birthday was the perfect occasion – mainly because she loves anything and everything I make. I used Whisk Kid‘s recipe and instructions; go to her blog to watch her make the cake on the Martha Stewart show. I baked the cakes yesterday afternoon and made the first batch of icing last night. Then, I stacked the layers and did a crumb coating of icing and let the cake sit overnight. Most recipes suggest only gel colouring will do for this cake; however, I used liquid food colour and the results look vivid enough to me. I have ordered a full set of gel colours from Little Betsy Baker’s stocktake, sale so I will use them for my next rainbow cake. The only container big enough to hold the cake and stand was my cupcake courier, with the trays removed. This morning, I made the second batch of icing and finished the cake. (The recipe specifies the quantities for each batch). The icing is Swiss meringue buttercream. This is the first time I’ve made it. It is a combination of sugar, egg whites, butter and vanilla. The recipe wasn’t too tricky and the first batch was perfect. There was enough to spread generous amounts between each cake layer and for the crumb coating. Batch number two was smaller and enough to cover the cake. This batch was a little problematic and I was afraid it wasn’t going to turn out properly, as the mixture took a while to come together in the mixer. Eventually, though, the icing turned out fine as the trusty Kitchenaid did her stuff. I would not have been able to make the icing without it. The second batch of icing has more of a yellow colour than the first. I’m not sure why yet. I’ll definitely make this type of icing again. I need to invest in some decorating tools and a larger cake plate but I managed with what I had. And yes, Nanna loved it. WOW – STUNNING – AMAZING – Great Job!!! I have loved this cake but never dared to try it!! The colours are fantastic, as are the photos…LOVE IT!! You could both make it with ease! I think you should 🙂 A pastel rainbow would be so pretty too. Same to you! Your blog is beautiful, I’ve come across it before in my travels 🙂 Going to add it to my reader. This looks awesome!! i’m contemplating making it for my daughter’s birthday this year, but am scared to!! 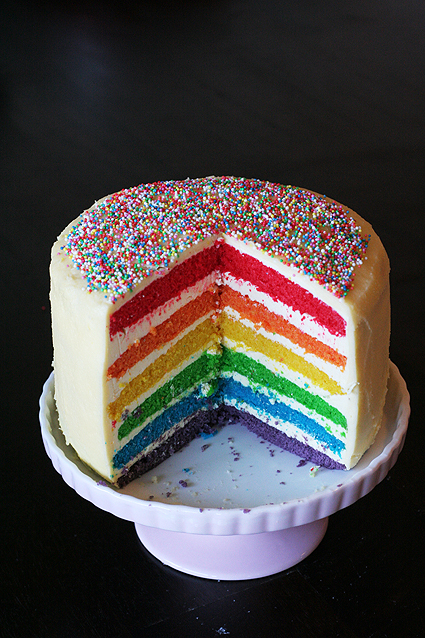 Hi, I’ve been planning to make this cake for a friend’s birthday and I can’t find gel food coloring anywhere. 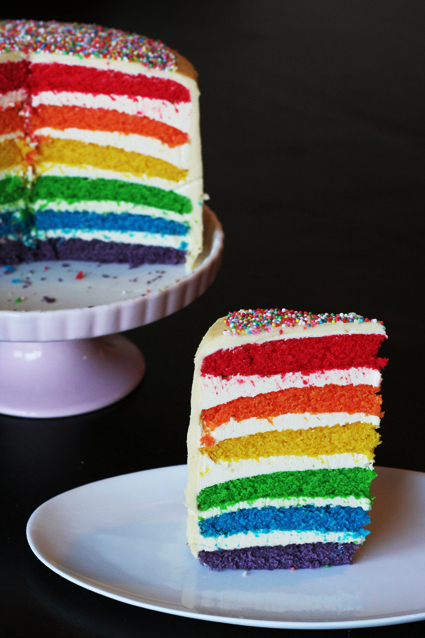 I was completely disheartened since Whisk Kid’s rainbow cake calls specifically for gel food coloring, but then I saw this! Your colors look really vibrant and I was wondering if you remember how many drops of coloring you used? I’m not sure to be honest, I kept adding until I was happy. Best to start off with a little and add more as needed. Good luck!